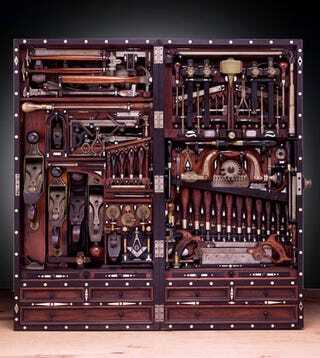 Sometimes, things as mundane as tool kits can look like great works of art. This piano repair box, perfected by Henry Studley, does a great job of fixing up instruments, but it's careful placement of knicknacks also makes it beautiful. Studley was an organ and piano maker, as well as a carpenter and mason, who worked for the Smith Organ Co. at the turn of the 20th century. His tool chest was loaned by his grandson to an exhibit at the Smithsonian Institution's National Museum of American History, until a private collector bought it.